Cooking in MMORPGs have always served something of a singular purpose - to give players stat increasing buffs and to grant temporary experience boosts. 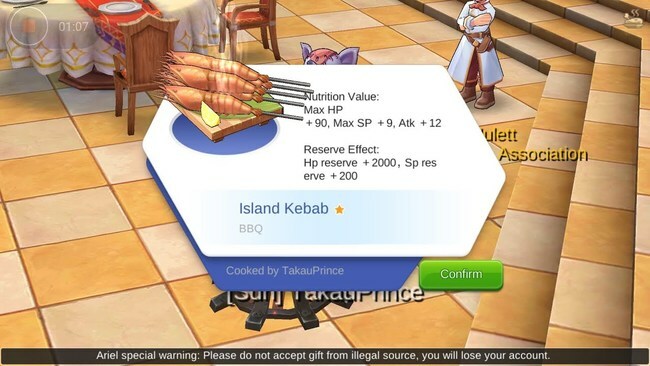 Ragnarok M: Eternal Love has a similar system to other MMOs with cooking functions. Naturally any player who wants to maximize their grinding will want to invest time into this mechanic as it not only grants you those tasty temporary buffs and experience bonuses, but gives you something to do once your daily stamina has depleted. Below we've outlined how to unlock cooking, which can be done in a few short steps! For more Ragnarok M help, check out our other guides on things like how to tame pets and how to use the skill reset. In order to pick up the quest to unlock cooking players must talk to the Entrance PC at the top left corner of Prontera's map. Once you've done that you'll need to find the NPC by the name of Pizza in order to initiate the quest itself. This NPC will teach you how to obtain cooking ingredients, which is fairly simple since it uses an item. She'll ask you to collect a few Lunatic Meats and Rocker Meats, after this the player will be given the Chef's Eagle Eye; this is how you'll be obtaining your ingredients via farming. To farm monster ingredients you'll need to make sure Chef's Eagle Eye is consumed before killing your target monster. Consuming the Eagle Eye will give you a buff that gives monsters a chance to drop cooking ingredients. You can purchase Chef's Eagle Eyes from the Material Shop for 2,500 zeny. If you're not interested in farming monsters to complete this quest you can simply buy them from the Primary Ingredients NPC located in the same room as Pizza for a little over 100 zeny a piece. After you've gotten all of the ingredients required go back to Pizza and deliver the goods. Doing this will reward you with the items Chef Hat, Food Storage Box (which is a separate inventory for cooked foods and ingredients), and a level 1 Cookbook which will grant you the ability to cook! After that it is as easy as opening up your cookbook from your inventory to start cooking. Leveling up your cooking ability is fairly easy as it involves cooking and eating cooked foods. While it may seem a bit tedious at first you'll want to invest time into this skill as later recipes will grant essential buffs and experience bonuses.